The Azd were originally a branch of the Sa’anaite Kahlan tribe that migrated to the fertile coasts of Oman in the 3rd century A.D. Powerful warriors, their tribal fortunes give them access to better armaments then the typical soldier. 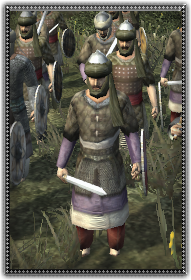 Finely made mail jerkins and Omani Kattara topped with a turban helmet give these swordsmen an edge over the other tribes. They are a great asset to the Imam at Nizwa and glorify the name of Azd.